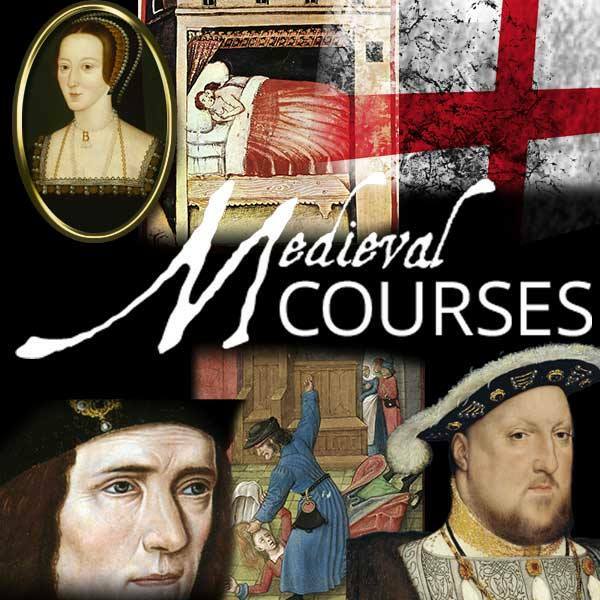 Have you always wanted to study medieval history but not had the time? There is now a unique range of medieval and Tudor courses which can be downloaded or followed online, complete with the full text from www.medievalcourses.com – once registered students have unlimited access to study at their own pace, and can complete online quizzes at the end of each module. The courses are professionally produced in thirty minute lessons and include up to 11 hours of teaching, plus bonus materials, reading lists and links to other resources. The tutors are all established experts in their field – but how did these courses start? Toni continues “I’ve been teaching history to adults for around twenty years, concentrating on the extraordinary lives of ordinary people – with an occasional look at the Kings and Queens of the period – but I was not keen on doing the recordings myself, so Madeglobal arranged for best-selling historian Claire Ridgeway to narrate the lessons”. Seven of the online courses have now been written by Toni Mount. The Roles of Medieval and Tudor Women – Explore the lives of Medieval and Tudor women of all classes, looking at relationships, earning a living, caring for the family and responsibilities in the home. The English Reformation – Examine the Reformation of the Church of England, beginning during the reign of King Henry VIII in the 1520s and continuing to influence events well into the 17th Century. Crime and Punishment – Examine the fascinating subject of English law and those who broke it. From Anglo-Saxon kings of the 7th century to prison reformers of the 19th century, this course uncovers unlikely stories of justice. Everyday Lives of Medieval Folk – Using examples of real men and women from the period, we find out just what it was like to live in and work in Medieval times. Heroes and Villains -Are the reputations of these icons of history justly deserved or should they be viewed in a new light? Examine their lives and then decide: hero or villain? Richard III and the Wars of the Roses – Richard III ruled as King of England for little more than two years, yet his life spanned three decades of civil war, the period of turmoil called the Wars of the Roses. The History of the Borgias – Explore the history of the infamous Borgia family, from their humble beginnings to their meteoric rise and fall. Life of Anne Boleyn – a very detailed look at this inspiring woman’s life. As one of the world’s foremost experts on Anne Boleyn Claire has put her all into this course. The Six Wives of Henry VIII – a fusion of political and private that shaped each of Henry VIII’s wives’ story, and disentangles them from the myths that surround them.